Celebrate Chinese New Year with five creative bookmaking projects. Reproducible patterns and clear directions make these books quick and easy. Based on the earliest book form in China, the Zodiac Slat Book has reproducible patterns with pictures of the animals, characteristics, and dates. A quick and easy journal bound with a chopstick and an elastic. The front cover has the Chinese word for luck. Count from one to twelve with Chinese numbers. Includes dragon head and tail patterns for the front and back covers and Chinese numbers for the pages. 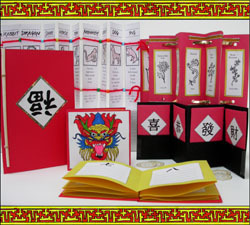 Bring luck for the coming year with this book of symbols. Ribbon and beads make this accordion book special. Make an accordion pocket book to hold four red envelopes. Includes characters to spell out Gung Hay Fat Choy and patterns of old Chinese coins to decorate.